In 1884, Grand Prince Constantine Constantinovich Romanov wrote a poem devoted to St. Elizabeth. It is part of human nature for individuals to search out exemplary people in history that serve as spiritual mentors. 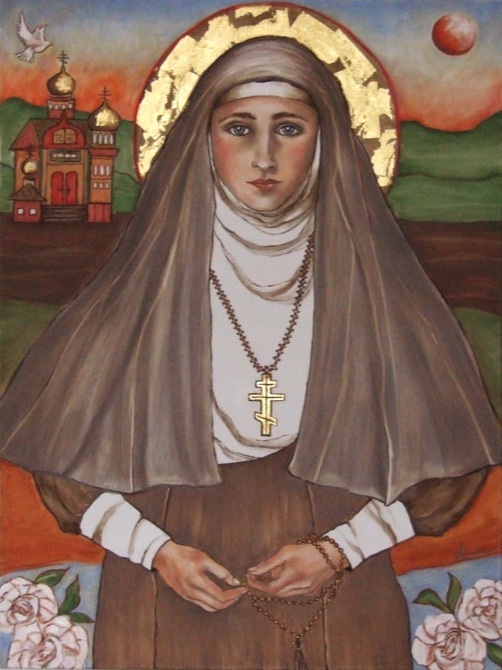 The individual Ariane is inspired by is Saint Elizabeth. She was sister to Tsarina Alexandra of the last Russian Royal family. On February 4, 1905, her husband was murdered. Subsequently, she donated all her wealth, even her wedding ring, to found the Monastery of Mary and Martha in Moscow. She hoped her work might help revive the ancient institution of deaconess: women ordained to carry on merciful service toward humankind. After spreading much love and helping many people, including countless children, on July 19, 1918, Mother Elizabeth, her nun Barbara and other innocent victims were thrown alive down an old mine shaft 60 meters deep by Communists. A local villager who witnessed what happened said he could hear voices in the shaft singing the “Cherubic Hymn” from the Holy Liturgy. The executioners threw in one hand grenade, then another, until there was silence. Her remains where removed and ultimately taken to Jerusalem. They lie there today in The Church of St. Mary of Magdalene on the Mount of Olives in Jerusalem.